What you must know to select your next MPLS provider? What you need to select your next MPLS provider? Choose from what you need to help your IT team select an MPLS provider. Everything offered below is FREE. The free WAN technology workshop - Techtarget.com writer Robert Sturt will attend your UK office and discuss the latest thinking across MPLS, VPLS and SD WAN. Ready to edit RFP template - we'll deliver a template to help you go out to the market. Step by Step Playbook - a stunning Mindmap to help you tick off the key and most important buying areas when engaging with providers. A proposal from Network Union - need to gain pricing, we're a fully featured BT Authorised Partner. A list of providers - we've created a list of selected companies for you to choose from and kickstart your project. How many IT Managers are able to list more than three of the usual global or UK MPLS provider suspects? It’s a common problem. But it’s not insurmountable, some of the most innovative providers are lesser known yet manage services for some of the most recognisable businesses with hundreds of sites down to smaller three site networks. There really is something for everyone. Obtain a list of the best / top recommended UK or Global MPLS WAN providers. Gauge their capability by aligning the specifics of your requirements with the market-place. They all started their WAN journey via our buyers pack. Watch to learn more. The migration of an MPLS network is the biggest reason cited for lack of change across Global and UK Enterprise businesses. The dual running of networks, user disruption, VPN presales documentation, tail circuit issues, bandwidth throughput, test planning, security and so on. Without careful thought and planning, managing migration could turn into a real business impacting issue. However, organisations are in a position to minimise these problems by gaining an understanding of the risks, pitfalls and opportunities. 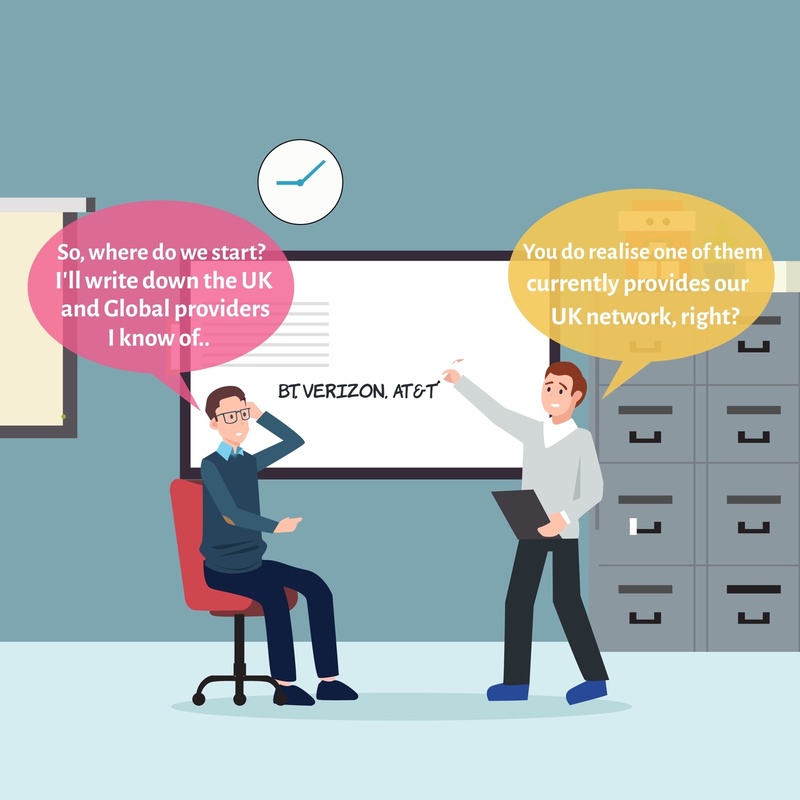 Many of the issues which occur are not the result of the actual migration work; they revolve around UK and Global MPLS providers poorly managing and planning the process. Negative management coupled with a basic understanding of where the risks often exist severely impact businesses. However, there are project managers we work with today who consistently succeed. Do they iron out every single issue? No, but they minimise and forewarn of problems as they occur and manage to steer the company around them. But. Even with the best and most experienced Enterprise VPLS or MPLS VPN project manager could be potentially doomed to failure with poorly defined business requirements and unrealistic global or UK delivery dates. Are your organisation's objectives clear and are you able to measure them? Do you currently have service documentation regarding project deliverables, timescales and required resources? At first glance, do the UK or Global MPLS providers deliverables look realistic next to the timescales? If work has already been started on your project, is there an audit trail? Is everyone within your business aligned with the end goal and do they understand what they expect to achieve? Project planning for global and UK MPLS providers procurement is a critical component of any implementation (unless you are talking about only a couple of sites). The need to clarify objectives is necessary to ensure everybody involved in the project is fully onboard with the requirements. If goals appear hazy, then your project may well descend into a commodity based buying decision. Also, and this is a real point of clarity, IT management need to distinguish between an objective and a requirement. The two are very different with ‘requirements’ being more accurate regarding the expected outcome. Pinning down the scope helps here since this describes the boundary to be drawn around what the project will and will not deliver. The value proposition is discussed as a ‘throw away’ term whenever we’ve experienced the typical sales meeting over the years. “We provide tremendous value” is spoken about as if it’s the gospel of UK account managers worldwide. The percentage of businesses which succeed in obtaining this kind of value is pretty small, especially in the sales arena. We believe clarity is required because it is so difficult to quantify value. Within the UK / Global MPLS providers marketplace, this requires a repeatable process which will surround the following core service areas. Here is a list of MPLS providers to get your project started. * The above represents the typical providers we all know of in the marketplace. Remember - the lesser known providers list is available. The current situation is perhaps an overlooked element but discovering what is and isn’t working for your organisation is the best place to start. We suggest beginning with how the solution is managed, consider some of the ways in which you are supported. Armed with this data, we recommend creating a statement of requirements based on the issues and problems or opportunities you uncover. Let’s talk about some of the crucial areas now. MPLS Network design and application type. Understanding the properties of VPN applications is a critical component of WAN procurement. The majority of apps fall into policy categories which align well to the typical IP QoS (Quality of Service) settings offered by telcos and carriers. Gaining clarity on your application types and flows will allow your organisation to understand how each packet should be treated across an MPLS providers core. What are the current types of diversity and resiliency into MPLS? The most common placed misconception is that using two providers is the best way to achieve network diversity — this is not the case. When implementing dual circuits, consider that neither company has access to their respective circuit network plans. This means that Ethernet tail circuits will often follow the same route out of the building which will result in an outage if a fibre chop occurs. In fact, the only way to achieve dual supplier resiliency is to create geographical separation if your business is intent on using dual suppliers. MPLS is one element of the Cloud. The cloud is the fix all solution to every IT problem, or so marketing would have you believe. As an example of where the cloud doesn’t necessarily provide a match for every solution, consider the mobile revolution which we are in the midst of right now. The result of this explosive mobile growth is creativity. Users creating content often need huge, fast local processing and storage together with the need to change a mixed collection of media. UK vs. Global WAN procurement? Global organisations are much more sensitive to latency. MPLS VPN topology and user data flows. The cloud, mobile and globalisation are changing the way in which typical global and UK topology is designed. When looking at your existing solution, consider how traffic flows from users through to applications. What are the potential risks associated with application downtime within the current circuits? What are the restrictions surrounding the existing VPN flow regarding points of failure with failover? An important aspect of application flow is the performance of IP applications from the host through to the application and, of course, the return trip. Understanding this monitoring and reporting data may require training or you may not have access to legacy trends due to your statistics capability (or lack of it). Statistics and trends are not just about latency and jitter; they are also about the performance regarding fix times — I.e. How the MPLS providers support department actions and processes tickets and issues through to completion. We often perceive any reports and analysis as purely technical documents, but I would advise writing about how the supplier communicates in general via the existing WAN. Other favourable trends to understand are growth both regarding user quantity but how the users are accessing resources. Is there a noticeable trend towards home working or collaboration? How are the users and their applications are adding value to the organisation? This analysis will support your recommendations when considering any new Global or UK MPLS network proposals. Diagnosing your existing situation is an essential component of our mindmap and will ultimately ensure you minimise the typical problems we see in the UK and global marketplace.The technical aspects of the MPLS WAN surround, in the main, applications. The core subject of apps is how the connectivity performs between the user and application. The technical aspects of the MPLS WAN surround, in the main, applications. The core subject of apps is how the connectivity performs between the user and application. In some instances, NNI (Interconnects between networks) will be used where the services do not have a local presence. In the case of NNI connections, the latency and jitter SLA may well not be known and, therefore, your organisation's expectations should be set accordingly. The bandwidth is becoming less of an issue with 100Mbps and 1Gbps Ethernet circuits being provisioned as standard. MPLS Network Diagram above shows dual Cisco routers, dual local Exchange termination points with dual Provider Edge nodes. If circuit A fails, traffic is automatically re-routed over to the second circuit. Our list demonstrates there are some points to consider seriously. The entry point into your building is largely determined by the availability of dual access points. In some instances, dual MPLS network access is simply not possible due to listed status resulting in no structural work being allowed. If dual points are provided, the circuits will typically route via either end of a building. Resilient CPE, using Cisco routers as an example, involves two routers running HSRP (Hot Standby Routing Protocol). The configuration is quite simple if one route fails, the other takes responsibility for the data. Tail circuits should always be ordered as a diverse official product. With the UK or global BT MPLS, their product is called either Secure Access or RA02 (Resilient Access). Other service providers will clearly have their branding for diversity products. Dual local exchanges are largely down to wholesale supplier infrastructure availability and are often not known until site survey occurs. When a diverse order is placed, the MPLS connectivity provider will attempt to create as much separation as possible. If a single exchange is delivered, different equipment will be used to minimise the risk of an outage and traffic downtime. With geographical diversity, a point to point link will be required between sites. The latency must be low to support the keep-alive packets created by HSRP. However, when to offices are located in different locations, the tail circuit routing to the provider will clearly be different. Fortunately, low latency point to point Ethernet connectivity is widely available. Dual Provider Edge MPLS Network architecture availability is largely dependent on scale. The critical question to ask any MPLS VPN service provider concerns their solutions True Edge scale. In some instances, marketing may state that a particular telco or carrier has 98% coverage and yet, when you focus in on the detail, the statement reflects wholesale access and not true edge coverage. On the subject of MPLS BGP Routing and Internet, considering using dual providers for MPLS network services is a daunting task. The Internet works differently to private based networks. Operating a multi-provider BGP solution is never an easy proposition. The free WAN procurement workshop at your office. Totally free, available at your office. Permira, CDC Global, Endava, Royal British Legion and others all started their MPLS providers buying journey via our workshop. Armed with a whiteboard and pen, Techtarget.com writer Robert Sturt will walk you through every key technology and buying area your Enterprise should be aware of to successfully procure WAN services. New for 2018: You'll learn why SD-WAN (Software Defined Networking) is growing in popularity but also the detail behind why the technology is not a great fit for every use case. Includes topics such as MPLS vs. SD-WAN, application performance, Global vs UK deployments, migration, topology, statistics are reporting, Quality of Service and more. Applications and their delay sensitive nature. Delay Sensitive - Voice and Video packets are typical delay sensitive applications and require strict priority end to end. Any delay outside of performance parameters will result in frustrating conversations. When considering a network, a focus is needed on end to end latency and performance to ensure your business is armed with the best possible user experience. Beyond voice and video, other critical applications include, as an example, Citrix. Although Citrix will stand a little delay and jitter, a consistent packet performance will be required to avoid user frustration. When considering the technical design of applications, the flow between user and server should be documented. Application Latency and Jitter performance - the performance of your networking applications is governed by the Uk or Global MPLS providers packet latency and in the case of VoIP (Voice over IP), jitter performance. When considering the SLA’s provided by WAN infrastructure connectivity, we need be mindful that the figures will almost certainly only cover core performance. When deploying global networks, IT Management should be aware that the tail circuit (distance between your site and the provider edge) will have an impact on latency. The step-by-step stunning IT Managers WAN procurement Mindmap. Includes over 15 years of research into the key areas you must consider when buying WAN, cloud and security. Presented as a single page stunning Mindmap. A step-by-step Mindmap detailing every key buying area we know to be important. We’ve also included our RFP template with an additional WAN requirements document. Used as a template by numerous organisations to procure MPLS and SD-WAN services. Ready to use and edit in both Microsoft Word and Apple Pages format. Includes our WAN requirements document, an additional supplement to the main RFP template. Pemeria, Royal British Legion, CDC and others have all made use of our unique buyers pack. Over a decade of experience distilled into a single Mindmap. Our step-by-step guide to WAN procurement incorporating MPLS, VPLS and SD-WAN. Every key are you need to consider. Our RFP Template and requirements document - ready to edit in MS Word or Apple Pages format. A free 2 hour workshop, available at your office or via webinar covering The Art of WAN procurement with MPLS, VPLS and SD-WAN as core subjects. Above. The usual suspects yet again. Cloud service into MPLS are available, Microsoft ExpressRoute for example. Consider an online magazine where retouching of photo’s or video production may be required. The theory that everyone is positioned well to replace local processing and storage, using the cloud, is not strictly correct. With this said, the cloud does offer a global, highly resilient, on-demand, secure capability for the primary applications which do not require a local presence. The success of cloud performance will be reliant on the underlying WAN technologies & connectivity or local Internet connectivity. Some applications should only be made available across the private based Global or UK MPLS IP VPN due to security and the requirement for a consistent, predictable delivery. The takeaway is to understand your specifics, applications, user set vs. local and cloud-based storage to begin the design process. Always remember that although the cloud is marketed as a cost-effective method of outsourcing our IT requirements, delivery of application traffic is an additional charge. The necessary bandwidth together with good latency and jitter performance infrastructure performance is critical to cloud-based application performance. Latency and tail management are two key aspects. Typically, an SLA will cover the core network infrastructure from edge to edge and not the tail circuit. In this respect, the latency between (for example), the UK and the USA may well be within the necessary performance parameters according to the SLA. In reality, the additional delay created by the tail circuit could push the application over the edge of satisfactory traffic performance. Multiple international tail circuit providers are harder to manage. Every country has their import restrictions, data privacy laws, regulation and so forth. Although your SP team should be aware, these elements will potentially create confusion and delay. Creating a list of the best/top providers? Creating a list of the usual MPLS service providers is fairly straight forward. But what about building a list of the top / best lesser known providers? The ones that provide managed services to some of the most recognisable companies on a Global basis?